First tape game I brought after getting a cassette player for my Spectrum +3. A 48K version on one side of tape and a 128K version on the other. The only difference I could tell was the 128K version had a speech sample when the game first loaded announcing the title of the game. Impressive feat considering the hardware limitations. You girlfriend Daisy has been egg napped by Zak and you have to get her back. A relatively easy game to play through and the first Dizzy to introduce other members of the Dizzy’s family, the yoke folk. These guys help you through the screens by giving you items. Part of the game includes a trip to Australia where the playing area is flipped upside down, you could make this a bit easier by turning your T.V upside down! Repeating the coin collecting from Treasure islands Dizzy once Daisy has been rescued you need to collect 50 coins to pay for your new home to live together in. 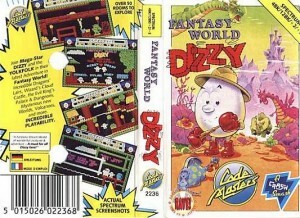 Dizzy was a very successful series with 8 adventures and several spin off titles. See http://en.wikipedia.org/wiki/Dizzy_series for more info.